Your karaoke party can be a great night for you and your guests. 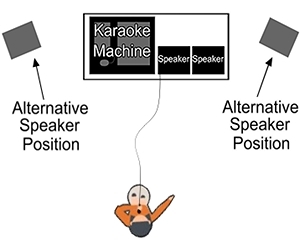 Understanding how the Karaoke machine works is essential. Fortunately it’s easy is easy to use so this will be no obstacle. By putting in place a simple structure to festivities pays big dividends. You want the party to be seamless and easy with as little facilitation from you as possible. This is very achievable. The following will show you how. Watch the pre loaded tutorials for the karaoke machine prior to the party starting. It only takes a few minutes. You may have to enter the first few songs for your guests. Show them how simple it is to add a song and they will soon be doing it for themselves. The advanced player is the best option as once it gets going there is very little required from you. The ideal height of the table on which to sit the Karaoke Machine is 55cm (Average Coffee Table). Tables upto 75cm (Average Desk or Dining Table) work fine for most adults. You can hire a 55cm high table from us for $15 inc GST, if required. Get the karaoke going as soon as possible. As the host it’s your job to sing first. Choose an upbeat song to start with. A classic is best. Something that people are likely to know the words to or at least the chorus. Nerves should not be an issue. If you weren’t nervous it wouldn’t be fun. And it’s all about fun. The setup below is common for home parties. Note the alternative speaker positions. Adjust placement to suit the room. For larger events or if you have space for a stage area the layout below may be more suitable. Even the Advance Karaoke Player is easy to use and it has a bunch of useful options that the Simple Karaoke Player doesn’t. The simple player is fine for playing one song after the other. However you have to enter each song after the previous song has finished. The Advance Player is no harder to use it just has more options. The most useful feature of the Advanced Karaoke Player is that you can enter multiple songs and allocate them to each singer. 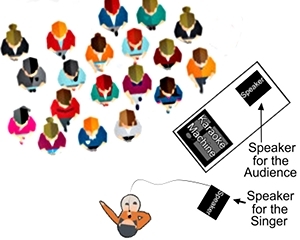 The Advanced Karaoke Player will display upcoming performers in the form of a ticker that scrolls along the bottom of the screen so the next three performers will know that they will soon be singing. After one karaoke song has finished the name of the next person to sing will appear on screen. You can even set the Karaoke Machine to start playing the song automatically after a short interval. The beauty of this is that there is no need to press the play button. Other than initially entering the singers song and name you karaoke machine will run itself. Set and forget. Encourage people to do duets. It takes the pressure down and is a brilliant way to get people to mingle. The Karaoke Machine comes with two microphones for a reason. Wondering what the go to karaoke duet is? Don’t Go Breaking My Heart, Elton John and Kiki Dee. If you thought it was Islands In The Stream you were wrong. The former suggestion is much easier to sing. The Lyrics loop over and over and the timing is as basic as it can get. Islands In The Stream is also a good choice if you can control your gag reflex. While I encourage you to have the guests enter their own songs, as it is easy to do, for larger and more formal events you may have a person allocated to manage the karaoke. In this case have participants write their name, song and artist on a slip of paper. This will stop people crowding around the karaoke machine while you enter each participant and their song into the machine. Take an A4 piece of paper and fold it into 4 sections lengthwise and 4 along it’s width so that you have 16 rectangles. Then cut them out. This is a good size to use as song request slips. Participants can then write down their song request and hand them to the karaoke machine operator. The operator can then enter the singers into the karaoke player without a crowd of participants milling around.